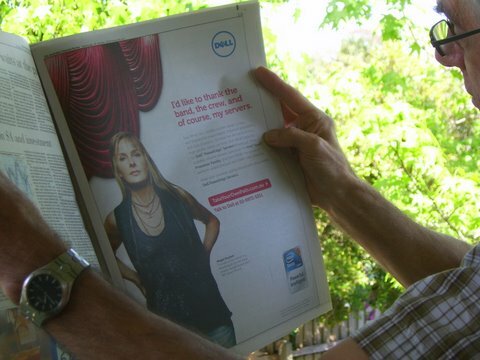 Shortly after Megan returned from her trip to Australia as a Dell Computers “Take Your Own Path” Trailblazer, her father (who still lives in Australia) was flipping through the October 20th edition of Australian Financial Review. He was surprised and delight to come upon a great Dell Computers ad featuring Megan. He couldn’t wait to send us photos of himself reading the ad. Take a look! With making custom stage drapes and theatrical backdrops for major artists such as Green Day and Lady Gaga, we have become (somewhat) used to seeing our drapes in a variety of magazines and videos. But seeing Megan’s photo in a full-page ad in a magazine in Australia is almost surreal! And so fun to see the photo of her dad reading the ad. You’d think we would become jaded – after all, this is the fourth nomination for Megan and/or Sew What? (we won the Stevie Award for “Most Innovative Company of the Year” in 2007), but the truth is, it is always exciting to be recognized. It shows that we aren’t becoming complacent, but are continuing to strive to improve the quality of our service and our product. I think that is a key thing for small businesses to remember – no matter how successful you are, it is so important to always be searching for ways to build on that success. With this world constantly changing, in terms of technology, economic conditions, and more, it’s important to realize that what makes a company successful one year may not work five years later. I am proud that Megan, Adam, and the entire team here at Sew What? Inc. is consistently thinking, “How can we offer our clients a more unique, better quality product? How can we make their experience with us more efficient, more helpful, and more creative?.” It’s nice to know that organizations such as the Stevie Awards recognize those efforts. I just read a terrific article titled “Can you be creative and still make money in Australia?,” which was published last week in the Sydney (Australia) Morning Herald online edition. Yes, I admit that I started reading it because the author, Valerie Khoo, had interviewed Megan for the article (during her trip to Australia). But I kept reading because it was a fascinating subject. Ms. Khoo makes some very good points. It’s great to be creative, but you can’t build a successful business based solely on creativity (that’s a hobby, not a business!). And that is what Megan learned. She was great at making custom stage curtains and theatrical backdrops. But if all she had focused on were making drapes, and had not also tried to work on the business itself, I don’t know if Sew What? would be as successful as it is today. Through the years, Megan and Adam have consistently tried to find ways to improve the business as a whole – yes, to offer better, more innovative stage drapes, but also to make our company more efficient, our business practices more “business-like.” We bought our own building, we contracted with a marketing agency for a new brand and website, we bought sophisticated integrated Enterprise Resource software, we worked with a programmer to develop our own software application to standardize our sewing plans…the list goes on and on. And Megan and Adam have been right there, every step of the way. Megan didn’t say, “Oh, I just want to be creative – find someone else to take care of this business stuff.” Of course, as Sew What? grew, we began to hire people to take care of some of the day to day operations (such as accounting and purchasing), but Megan remains focused on the company and continues to look for ways to improve Sew What? Inc., both from a creative standpoint and from a business standpoint. So great that Ms. Khoo recognized this and included Megan as the main example in her article. In the past, I have posted about different ways to use Pipe and Drape, in addition to traditional exhibit booths (such as for trade shows). Well, recently we were contacted by Aaron Valdez, who asked for our help in creating a unique item using pipe and base hardware and custom drapery. 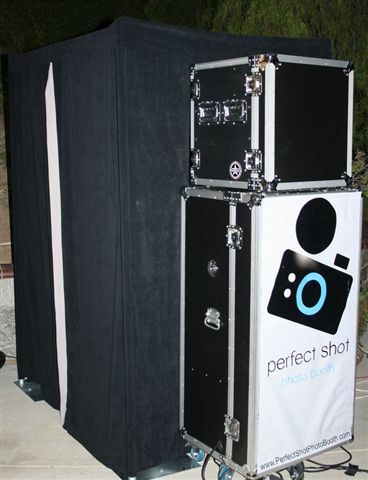 Aaron Valdez is the owner of “Perfect Shot Photo Booth.” He had a great idea – utilize pipe and base hardware and custom drapery to create a portable photo booth for use at weddings and special events. Aaron had the vision, but he needed help in figuring out how to achieve his vision. Gwen Winter (Sew What? Senior Sales) worked with Aaron in designing his “perfect” photo booth. The hardware is simple – pipe and base hardware including uprights, bases, and telescopic drape supports. It is the drapery that turns it into a photo booth. We utilized Black 15oz Encore, which is not only a blackout fabric, but also has an attractive back, so that no lining was required. The drapery was sewn so that the hardware was concealed both inside and out, and included a custom top as well. Doorway openings were made on both sides, creating an entrance and an exit, and Pewter 15oz Encore was used as a trim, to make the entrance and exit easily identifiable to guests inside the booth. I think it turned out great – what do you think? I wanted to write and tell you thank you so much for all of your help in tending to our project. Your customer service as well as that shown by the entire staff at your company has been unparalleled. I was immediately impressed at the warm reception we received when we entered your office. What started out as a curious visit ended in you creating a design that was even better than I had ever imagined possible for our company’s application. The photo booth is now in full operation and is working excellently. It looks very professional thanks to your design ideas and your company’s implementation of it. Thank you so much for your help in our endeavor and you have certainly made us a lifetime customer. I’d also like to add that I was especially impressed at how my designer, Gwen, sat down with us and made sure she understood exactly what my vision was and then created a design to fit my specific application. So many other companies only had a generic answer for me while Sew What? Inc. worked with me to design something that was exactly what I needed. Right now, Megan is in the midst of a long plane ride, returning to Sew What? after a productive trip that included Washington D.C. (for Inc 500/5000) and Australia (for Dell Computer’s “Take Your Own Path”). We are so looking forward to having her back, and I’m sure once she settles back in, she’ll be posting about her trip. In the meantime, I thought you might be interested in content that Dell Computers has posted regarding the Australia Trailblazers (including Megan). Check it out! Yes, the focus is on technology, but I find it quite interesting to learn how people in various aspects of business utilize technology to improve their businesses.